The Toptal brand includes the Toptal name, logo, graphics, colors, etc. Follow the guidelines on this page when creating Toptal content or using the Toptal brand for marketing purposes. The Toptal color scheme features 5 colors: blue is used for headers, green is used for buttons, white is used in background spaces, and gray and black are used for text. Do not use slight variations of these colors. Do not use completely different colors. Do not swap color purposes (e.g., no green headers). Use these colors for all material on the Toptal.com site. Use these colors for any Toptal flyers, ads, or other company materials. Colors should be used as intended (blue headers, green buttons, etc.). We use two fonts: Proxima Nova for headers, sub-headers, and main body texts, and Helvetica Neue, which is used sparingly when a secondary font is called for. Toptal.com uses both the light and regular versions of the font. Check the graphic to the left for proper usage. Click the button below to visit the font page. Check the graphic to the left for proper usage and remember that it only is to be used as a secondary font. Do not use different fonts for pages in the Toptal.com domain. Do not use Helvetica Neue as the primary font. Do not use Helvetica Neue for headers, sub-headers, or main body texts. Acquire the fonts using the above links. Use both fonts when creating Toptal pages. Use Helvetica Neue sparingly, primarily for capitalized links. The Toptal name should always be spelled with only the first “T” capitalized. Note the examples below of correct and incorrect ways to spell Toptal. This is the correct way to spell Toptal. The second “T” must not be capitalized. The first “T” must be capitalized. Correct spelling is mandatory each time the name is used. Use Proxima Nova for the name on Toptal.com, unless it's embedded in Helvetica Neue text. Do not use the incorrect spellings of the Toptal name anywhere. Do not use alternate spellings not shown above. Use the one correct spelling of the Toptal name in all places. These rules apply to all text. The Toptal logo is distinct. 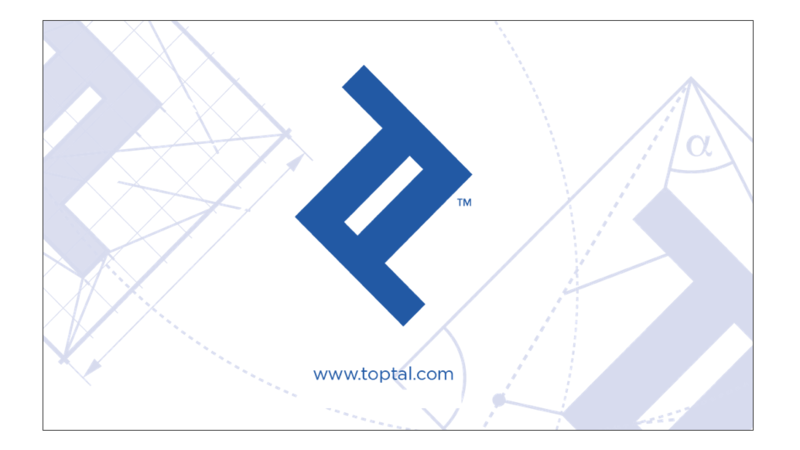 The Toptal logo consists of the blue text and graphic on a white background. Follow the guidelines below when using the logo for any purpose. The border must be at least 50% of the logo height on all sides. The border must be white space. Do not cut, adjust, rotate, flip, reflect, or manipulate the logo. Do not change the color of the logo. Do not use less than the specified border width. Do not use the logo for non-Toptal material. Use the logo to market any Toptal material. Use the logo for both print and web content. Use the 300DPI version of the logo for print. As ambassadors of the Toptal brand, you may use your Toptal business card to refer potential new clients, developers, or anyone interested in the company. You will need to specify your contact information. Include your business card in emails to new clients/developers. Bring sample business cards to any conference or Toptal event. 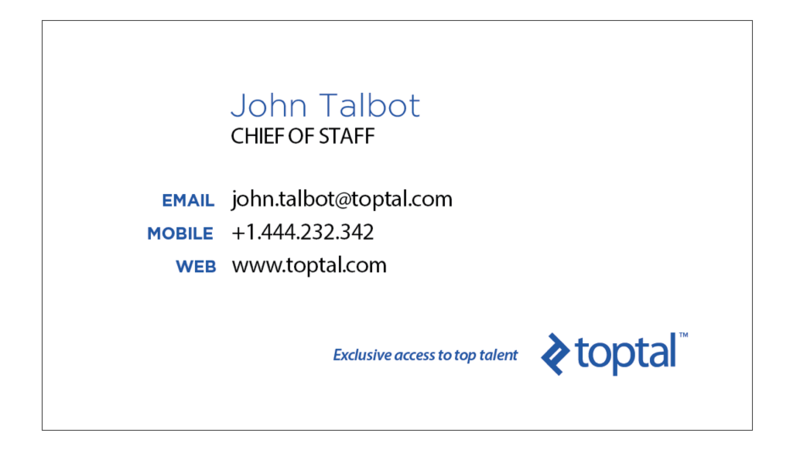 Only list your Toptal email address on your business card. Do not list non-Toptal emails or non-personal phone numbers. Do not list personal websites. Do not alter the business card design. Use your business cards to develop professional relationships. Use your business cards to grow the Toptal brand. Questions? Ask our Design Team! The Toptal Design Team works hard to make sure all Toptal materials look great and perform well. If you have any questions about proper usage of the Toptal brand, requests for more resources, or anything else, contact the Design Team and let them know.